← What’s The Point of Astro Navigation When We Have The GPS? In astronomy, we need a celestial co-ordinate system for fixing the positions of the celestial bodies in the celestial sphere. We express a celestial body’s position in the celestial sphere in relation to its angular distance north or south of the Celestial Equator and east or west of the celestial meridian that passes through the ‘First Point of Aries’. Declination. The Declination of a celestial body is its angular distance north or south of the Celestial Equator. The declinations of the stars change very slowly and can be considered to be almost constant for up to a month at a time. The declination of the Sun changes relatively fast from 23.43o N. to 23.43o S. and back again during the course of a year. The Moon’s declination is more difficult to predict because the rate of change is even more rapid than that of the Sun and the pattern of the changes is less uniform. The declinations of the planets are complicated by the facts that they are at varying distances from the Sun, have different orbital patterns and travel at different speeds. 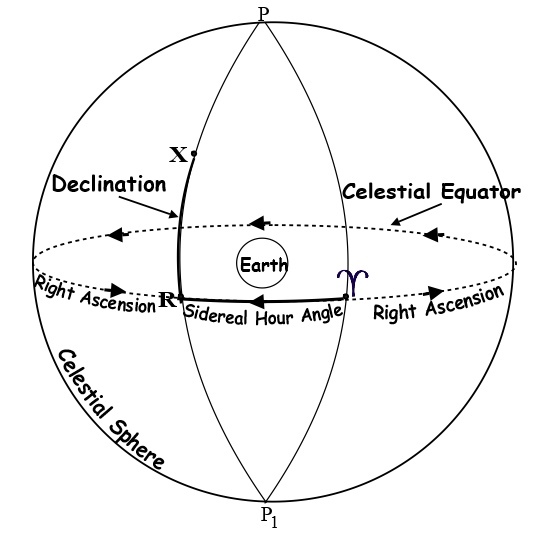 Declination can be summarised as the celestial equivalent of latitude since it is the angular distance of a celestial body north or south of the Celestial Equator. Note. The latitude of the tropic of Cancer is currently drifting south at approximately 0.5’’ per year while the latitude of the tropic of Capricorn is drifting north at the same rate. The First Point of Aries is usually represented by the ‘ram’s horn’ symbol shown on the left. Just as the Greenwich meridian has been arbitrarily chosen as the zero point for measuring longitude on the surface of the Earth, the first point of Aries has been chosen as the zero point in the celestial sphere. It is the point at which the Sun crosses the celestial equator moving from south to north (at the vernal Equinox in other words). The confusing thing is that, although this point lay in the constellation of Aries when it was chosen by the ancient astronomers, due to precession, it now lies in Pisces. Right Ascension (RA). This is used by astronomers to define the position of a celestial body and is defined as the angle between the meridian of the First Point of Aries and the meridian of the celestial body measured in an easterly direction from Aries. RA is not used in astro navigation, Sidereal Hour Angle is used instead. X is the position of a celestial body in the celestial sphere. R is the point at which the body’s meridian crosses the celestial equator. PXRP1 is the meridian of the celestial body. is the First Point of Aries. PYP1 is the meridian of the First Point of Aries. The Sidereal Hour Angle is the angle YPR. That is the angle between the meridian running through the First Point of Aries and the meridian running through the celestial body measured at the pole P. It can also be defined as the angular distance YR, that is the angular distance measured westwards along the Celestial Equator from the meridian of the First Point of Aries to the meridian of the celestial body. Right Ascension can also be defined as the angle between the meridian of the First Point of Aries and the meridian of the celestial body but the difference is that it is measured in an easterly direction from Aries. SHA = 360o – RA. In Astro Navigation, we make use of our knowledge of the positions of the celestial bodies to help us to navigate on the surface of the Earth. However, in order to do so we must first relate their positions in the celestial sphere to positions on the Earth’s surface. The next post in this series explains how this is done. A more detailed treatment of this topic can be found in Astro Navigation Demystified’. This entry was posted in astro navigation, astronomy, celestial navigation, celestial sphere and tagged astro navigation, astronomy, Celestial Co-ordinate System, celestial navigation. Bookmark the permalink.